We believe in growth through constant learning which is why we set ourselves the challenge of reading one book every two weeks for 2017. Our theme of growth, entrepreneurship, mindset, and success has inspired our peers, clients and team and we have been inundated with recommendations of books that have changed their lives! Our fellow Google mentors have come up with some great titles - Google mentors' business books for startups, as has our team – and we’ve taken a leaf out of Mark Zuckerberg and Darren Hardy’s reading lists too! 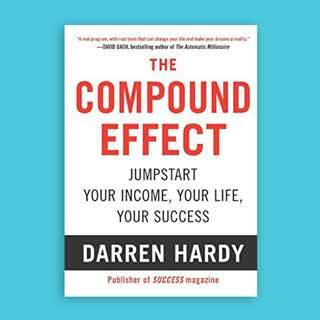 Our reading list kicked off with ‘The Compound Effect ‘by Darren Hardy. The Compound Effect is a great book to get you started on a new course. Darren Hardy, publisher of Success Magazines extols the virtues and vices of routine habits. The point being is that inconsequential actions, repeated consistently over a long period (think 18 months’ minimum) add up to a significant positive or negative effect. The book kicks off with some simple but effective demonstrations that underpin the point of the compound effect of repeated actions and argues that to really change the game, you need to change the small stuff. He talks you through practical exercises along the way to get the theory really embedded into your daily life. Firstly, is the soul-searching task of working out not only what you want, but more importantly ‘What is your burning desire to really achieve this goal’ a.k.a. your ‘Why Power’. He then moves on to discuss the common place theory that ‘You are the average of the five people you most associate with’, but does this in a different way, encouraging you to practically assess your environment, create a plan to associate with people who have the attitude/life/mindset that you want, and commits you to implementing the plan in manageable steps. This then naturally leads to goal setting, and monitoring of your plan of action daily. It’s not about beating yourself up if you don’t manage to achieve every action you planned, every day, but it is about bringing to your attention, the long-term effects of not successfully implementing a habit. Installing Feedly and removing my other news apps to ensure only relevant news fills my feed to keep me to my commitment to reading 3 industry articles a day. Telephoning a new prospect client 2 times a week. The final one I’m really struggling with is 10 minutes’ meditation every morning, but my toddler, newly released from his cot, to a bed is beating my alarm clock, so this may need a routine re-jig! So does it work? Ask me in 17 months! But it’s certainly made me realise that if you want it enough, you will find a way to find those extra few minutes a day, and that these changes, whilst small, will have a compound effect, changing your life towards how you want it to be. We’d love for you to join Eye catcher's year of reading challenge to participate in the book discussions but if time’s just too short for you right now, you can sign up to Visionary World where we feature our ‘Book of the month’ summary, along with a round-up of the latest news in health tech, start up and creative, digital marketing.